What is the Nigerian Email Scam? I’m sure that by now you’ve heard of the Nigerian email scams that are still being emailed out to millions of people every year and claiming new victims. These scams continue to bilk innocent people out of their money and more, even though the basic scam itself has been around for hundreds of years. These emails are a typical example of how fraud and various scams are easily disseminated among a large group of people. The Internet is a great distribution method for crooks who want to attempt this scam since emails are cheap and getting millions of email addresses to send their letters to is relatively easy. What Are the Basics of This Scam? A rich person from another country, or possibly a representative for said person, contacts you, generally via email (though fax and snail mail aren’t unheard of). Regardless of who contacts you, it’s actually a con artist and not a rich person or their rep. NOTE Although are normally referred to as “Nigerian scam emails”, these emails can technically come from any foreign country. The rich person/con artist claims they’re trying to invest their money, or maybe just trying to get it out of the country (often due to political upheaval or pressure), but needs an external bank account to transfer it all to safely. That’s where you come into the equation. In exchange for transferring a large sum of money and “helping” the con artist, you are guaranteed a percentage of the transaction. This is normally a large enough percentage that it’d be like winning the Lottery. If you should be so… unfortunate… as to accept the offer, you’ll no doubt be contacted and told that there is some kind of problem: Some official needs to be bribed, perhaps a transfer fee is needed, new or underestimated attorney fees, or something along those lines. The con will ask you to front a certain amount of money to take care of the problem and will assure you that you’ll either be compensated at the end of the transaction or that the amount you’re getting in exchange for the deal once it all goes down will overshadow the “small” amount of money you’re asked to put up. This is the part where they try to part you from your money. After you’ve fronted the money for the problems that arise, you’ll very likely be told of more problems that require additional money to be transferred until you’re either tapped out of money or the con artists decide to move on. Either way, you end up the loser in this con game. 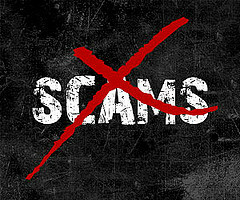 Who Are Typical Victims of This Scam? Unfortunately confidence scam victims come from all walks of life. Rich, poor, old, young… who you are and where you come from doesn’t matter to a Nigerian email scam artist. Out of the millions of emails they’ll send, they only need a handful of marks (e.g. victims) to make their email scam a success; the FBI estimates that millions of dollars are lost every year to these Nigerian/419 scams. They’ll take whomever they can get. The first rule of Don’t Get Scammed Club is… use common sense. If it’s too good to be true, it probably isn’t true. Secondly, always be wary of any email, IM, or other communication from a stranger that involves money or personally identifiable information. If you think that you, or someone else you know, is currently being targeted by a Nigerian scam email proposition here in the US, contact the FBI or the Secret Service. This is a a serious problem that needs to be stopped.